There’s an obvious choice for the most striking bit of tonight’s episode, and it’s when Bob shatters the skylight window of the wilderness store to make his escape. It’s a hell of a climactic moment for “Into The Mild,” one that works equally well as comedy and as rousing action adventure. This is by a wide margin the most badass thing Bob has ever done, to the extent it’s clear that none of his family members actually believe his story—honestly, their disbelief was so total that I wondered for a second whether the whole thing really happened, even though I had just watched it all. So the episode gives the viewer two ways to respond to Bob’s feat. Either it’s kind of pathetic that Bob getting up a climbing wall, shimmying across a girder, and breaking a window is such a big achievement in his eyes, or he’s right to think that all that is incredible. Those aren’t mutually exclusive, and it’s not that an audience member is likely to consciously struggle between these two possibilities. Rather, Bob’s Burgers is simply a smartly constructed show, one that can operate on multiple levels and provide the viewer with lots of different ways to enjoy an episode. The most straightforward comedic thread here is that of Bob struggling against life’s latest set of ludicrous indignities. Like all the best stories built on Bob’s suffering, he brings it on himself, but only in the most minor and mundane of senses. He dares to dream, for just a second, of being a kayak guy, and this is the kind of hubris the cosmos will punish him for in the most hilarious disproportionate ways. Well, he’s also kind of a jerk to Austin, but then that guy really is a bit much to deal with. There’s a sad-sack poetry to Bob going to a wilderness equipment store to take advantage of a clearance sale, falling asleep in a tent, and then finding himself unable to call for help because his phone is so old and terrible that it’s long since run out of juice. (As the very recent owner of an outdated phone, I can relate.) Again, all this works on two levels: It’s straightforwardly amusing to see Bob struggle amid his family’s mockery, and all these little storytelling decisions create a larger logic to justify everything going against him, which keeps Bob’s Burgers from feeling too mean-spirited when it starts punishing Bob. Austin’s presence in the locked store offers a target for Bob to focus his incredulity on. He’s a delightful guest character, that rare creation who endears as he irritates. Austin is absurdly confident despite his total lack of competence in just about anything, yet there’s no arrogance here. He simply overestimates his mastery of the various outdoorsman equipment at every turn, until he’s hanging upside down 40 (or maybe 50!) feet above the store floor. There’s more than a little Teddy about Austin, as he has the same utter inability to shut up as Bob tries to muster up whatever athletic ability he has. The only major difference between Bob’s old and new best friends (they totally are, Bob, just admit it) is that Austin is spry enough to make it up that poorly knotted climbing rope, which makes Bob’s inability to scale it all the more embarrassing. Bob being riotously out of shape will never not be good for a laugh, as he asks to take not one but two breaks almost as soon as he starts climbing. That failure makes his eventual climb up the wall even more impressive—if anything, the episode underplays just how remarkable it is that Bob successfully made it up that wall without a rope. But then Bob’s climb gives him and Austin time to discuss just why this goofy outdoor equipment means so much to them. As Austin puts it, maybe he’s just a poser, a guy with no real aptitude for wilderness adventure but a preternatural gift for demoing and selling the stuff. If we’re trying to be deep here—which, yeah, I know, I’m always trying to be deep here—there’s a point to be made about how it’s all about the aspiration for both Bob and Austin, as looking at and trying out this gear makes them imagine adventures they aren’t actually ever likely to have. But it can also be more basic: This stuff is just cool, even apart from whatever grand trek into the unknown they are intended for. That’s why Bob can have his big heroic moment without ever leaving the wilderness store. He puts a couple of those tools to use in clambering up that wall and shattering the glass, and the animation is generous enough to treat this as the big heroic moment it clearly is in Bob’s mind. And honestly, it probably is: If Bob has ever done anything to earn the big dramatic underneath shot as the glass shatters and falls to the ground, this is it. The subplot, with Linda and Gayle coming to finger-gun blows over just who Delta Burke acknowledged all those years ago, is a delightful bit of silliness. As a general rule, if Gayle is making art, funny things are likely to happen, and her one-woman show is every bit the overwrought bag of neuroses and petty score-settling that we can expect from her. That Linda, who makes such a genuine effort to be a supportive sister, can be just as obsessive about Delta Burke isn’t exactly surprising, given this is Linda we’re talking about, but the escalation to them calling their (former, it turns out) friend to find out the truth is inspired in its ridiculousness. And, much like the main story with Bob, the episode knows just when to pivot to key back in on the emotion, as Linda switches gears to side with Gayle in saying that definitely was Delta Burke, all compelling evidence to the contrary. 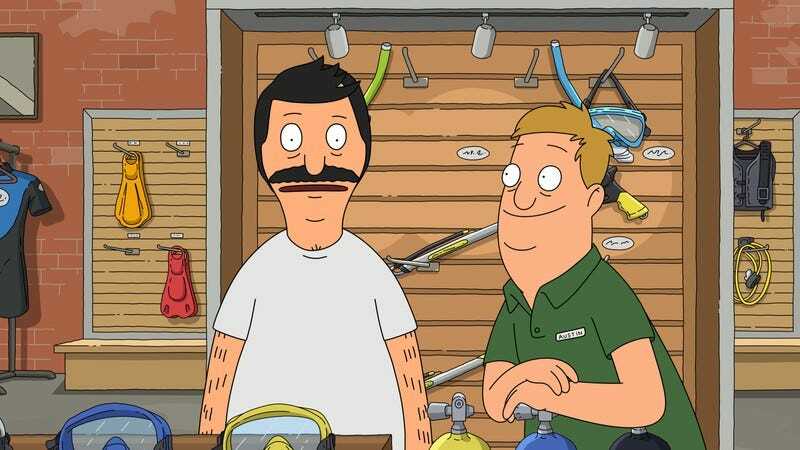 “Into The Mild” is a fine bit of extra Bob’s Burgers goodness to round out the season. It offers all the laughs one would hope for while also landing some sweet character beats. Those can range from the straightforward and familiar—Linda coming to her sister’s aid—to the hyper-specific, as Bob and Austin bond over their shared love of outdoorsman stuff they will never use. 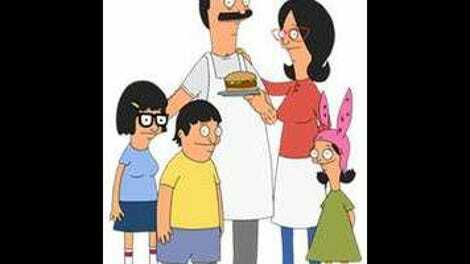 That’s part of the joy of Bob’s Burgers, as it can move effortlessly from one kind of situation and one kind of character beat to the other, the whole thing united by the endearing weirdness of its characters. As a kind of belated postscript to this season, tonight’s episode is a lovely way to say goodbye to the Belchers for a few months, especially when it gives Bob a moment of accomplishing something truly spectacular. Not that anybody would ever believe him, but then what else is new? Considering how high-energy Austin was, it says a lot about guest voice Rob Riggle that he toned down his normal performance to the point I didn’t recognize him. Let this be a lesson to all aspiring security guards: Any job is easy if you just assume everything is a false alarm. Maybe I’m just a hopeless romantic, but I’m hoping Austin can work things out with the coconut-smelling woman from cycling. Those two seem like they have a real future together.